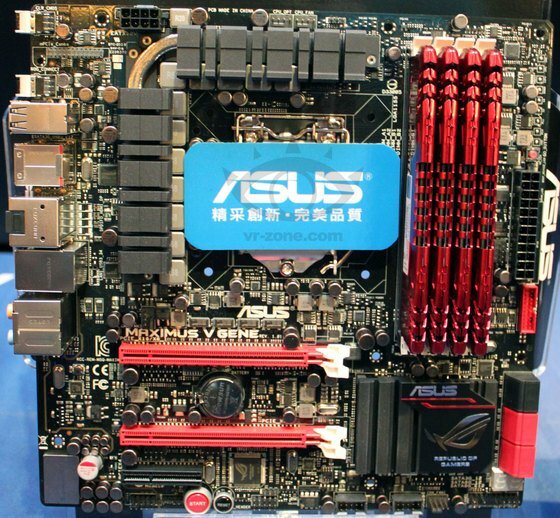 VR Zone gives us some photos of the Maximus V Gene, a new mATX motherboard from ASUS based on Intel's Z77 chipset. It should be available by the end of April. In general the Maximus V Gene builds in the Maximus IV Gene, it has two x16 PCI Express 3.0 slots as well as a single open-ended x4 PCI Express 2.0 slot and Asus stuck with the standard two SATA 6Gbps and four SATA 3Gbps ports offered by the chipset. There are headers for two USB 3.0 ports and four USB 2.0 ports as well as a POST80 debug LED and power and reset buttons.